#76 "Artists of Episode III, Star Wars Origami"
Spotlights the talent found in the Episode III Art Department with an article filled with amazing new art from the forthcoming Star Wars finale. Also in this issue, see the works of the artist that started it all. Back when George Lucas was shopping Star Wars around to find an interested studio, all he had was the script and works of breathtaking art from concept artist Ralph McQuarrie. This issue looks back at the career of this original Star Wars visionary. For readers inspired by all this creativity, this issue features instructions on how to create your own Star Wars works of art through origami. For model makers on a budget, a few squares of paper are all that it takes to build a fleet. Also, find tips on decorating your home to tastefully express your love of the saga. 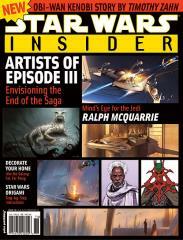 This issue also features the first part of a Clone Wars story by Timothy Zahn. In "Changing Seasons: Part I—Guardian of the People," Obi-Wan undertakes a dangerous mission into hostile territory without backup. All the regular favorites fill out this issue, including Set Piece, Comics Link, Bookshelf, and Scouting the Galaxy.